Brian is shopping for a pair of Chinos on a fashion retail app. He adds it to the shopping cart, clicks on the ‘check out’ button, enters the name, delivery address and e-mail. He takes out his debit card and enters his details. Now the order is contingent on Brian clicking on ‘Make Payment’ button. But Brian closes the app without completing the order. Brian has just abandoned the cart. According to Baymard Institute, a UK based web research company, 67.45% of online shopping carts are abandoned. That is around 7 users out of 10. The number is worse when the users shop via apps. For retailers and marketers, cart abandonment rate is a grim metric to keep a tab on. Nevertheless, it’s a crucial one. Overlooked, it can really hurt your bottom line. According to studies, a customer can abandon a cart because of a plethora of reasons, the most obvious of which is money. Either the user steps back to hunt for better prices or unexpected costs creep in the final payment. But it’s not all about money. Users tend to disengage with your cart if the checkout process takes too long, the app navigation is too complicated or simply because of the payment security concerns. But what if you can fix those abandoned carts? Just think of it – If you get those 7 users back to their shopping carts with their wallets and better yet, make them complete the orders, it can lead up to 3X sales. Sounds lucrative. Doesn’t it? So here are 10 smart hacks to fix abandoned carts. According to Statista, about 17% of the users abandon a cart because of payment security concerns. One way to address such concerns is showing a security badge on the checkout page. Moreover, offering live assistance on the checkout page boosts the app’s credibility. It’s also crucial to offer the customers multiple payment options incl. cash on delivery, debit card, credit card, PayPal and net banking. Instappy powered retail apps come loaded with secure payment gateway integration without any set-up or maintenance cost. Sending abandoned cart e-mails works great because of two reasons – First, the open rate of such e-mails is encouragingly high. Second, it’s very effective in bringing the users back to the cart and complete the purchase. When it comes to abandoned cart e-mails, timing is critical. The best approach is to send two e-mailers – The first one right after 20 or 30 minutes, the user abandons the cart. The second one should be sent after a day or two. Personalise the subject line the best way you could. Give as much detail of the product as possible, including price, colour and the size they selected. Most importantly, your call-to-action should be super clickable. Shoppers put more trust on reviews and testimonials than product description. It’s only human. The geek wants to know the bass quality of the headphones he is buying; the fashionista wants to know the feel of the fabric; and the house maker wants to assure the blender she’s buying is durable. Adding customer testimonials to the final checkout page make customers confident about the purchase, thereby minimising the chances of cart abandonment. Sometimes the users leave a cart even if they like the product. Maybe, they didn’t like it enough or they are in a lookout for a better option. Such users need a little nudge to complete the purchase and offering related products, accessories and top ups does that to the hilt! According to Statista, more than half of the users abandon shopping carts because of hidden fees stemming up unexpectedly in the final checkout page. A smart way to deal with this, without cutting your margins is to bundle shipping and handling fees in the product cost itself. As a retail business, it’s better to reveal all the costs involved upfront rather than adding them later. Once the customer makes a choice, he should be able to make the purchase in as few taps as possible. The simpler the checkout, the lesser are the chances of cart abandonment. Design an optimised checkout procedure that gives the buyers a seamless shopping experience. Visit any leading e-commerce site and the first thing you’ll see is a pop-up “New here? Get registered”. Now step into customer’s shoes – What if he doesn’t intend to get registered? What if he’s just checking out your app? Well, in that case he’ll simply move on. Let’s face it – Unless you are the eBays and amazons of the app store, users aren’t inspired to create a new account. The solution? Enable users to shop as a guest or better yet, allow them to login to your website using their existing social media profiles or e-mail addresses. While buying online, customers especially the shopaholics anticipate ‘buyer’s remorse’. Having a robust return policy counter this negative feeling and instill confidence in customers to go ahead and make the purchase. 77% of consumers say they would consider going back to the shopping cart and complete the purchase if they are offered free shipping (Source: Inc.). If it works for you, offering free shipping on an order in the abandoned cart can work wonders on getting the customers back with their wallet. If you don’t have the bandwidth to offer free shipping, set a minimum price threshold for your customers to avail free shipping. This is perhaps the oldest trick in the book – Scarcity of time or quantity, increases the perceived value of a product/service. Our brains are hardwired like that. Creating prompts that ask customers to act soon while the supplies last, not only checks cart abandonment but elicits immediate buying action. Money left on the table is money lost. The money lost due to abandoned carts run in trillions of dollars. 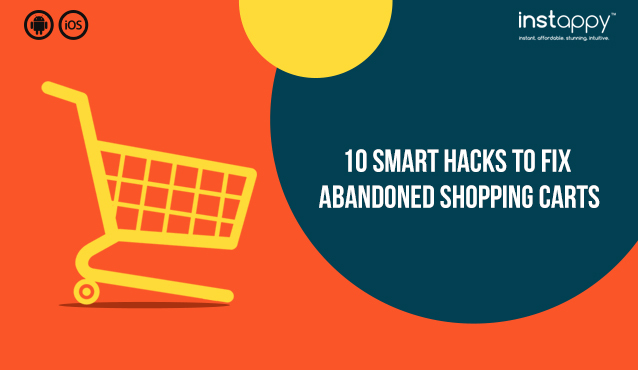 By applying these simple yet smart hacks you can keep a check on cart abandonment rate. And remember, reducing cart abandonment rate has no quick fixes. It takes time. Instead of pulling your users all the way back to the abandoned cart, identify the exact reasons for abandoning, resolve the issue and then send tailored prompts to complete the purchase. Did we miss anything? If you have any other suggestions to fix abandoned carts, let us know in the comments section.